My new play is about the extraordinary true story of how an architect’s assistant from Bolton crossed the Atlantic in 1891 to meet visionary queer American poet, Walt Whitman. James W Wallace set up a reading-group called the Eagle Street College in Bolton and it became a springboard for popularising Whitman’s poetry to the emerging socialist movement. We’re now two thirds of the way through the tour of The Adhesion of Love. I’ve seen all of the performances. Read the reviews. Collated the audience questionnaires. One element of the production has aroused more comment than any other is the casting of Billie Meredith, a young black woman, as Walt Whitman, an old white man. The commentary has mostly been about how brilliant Billie has been in the role, but I thought it might be worth considering our journey in dramatising this all-white past. The LGBT record of the past is sparse. It is dominated by self-censorship, coding, the destruction of love letters and diaries by embarrassed family heirs and the wilful misinterpretation of what has survived by researchers who ought to know better. And that’s just for the white, privileged guys stuff. Add racism on top, and the chances of any record of queer people of colour from the past existing becomes that much more rare and unlikely. This is true of records of the Eagle Street College. All white. Not that these white men aren’t fascinating, clever, bold and pioneering in a day-to-day sort of way, but some of them casually use language in their records which is horrifying to the modern ear. The travelogue of my leading character, Wallace, contains casual mention of having his shoes cleaned by a “blackie”. More extraordinary and troubling is the book on cosmic consciousness that Whitmanite Dr Bucke writes. Bucke goes into the most extraordinary racist tract about how Aryan brains are evolving faster than others as they are explicitly a superior race. How do I, as a white playwright and producer, address that? Do I use the casual racist language of the past in the dialogue? To do so with no context or explanation seems to me to trivialise. If race is being evoked as an issue in this way, then it must be dealt with as one of the themes of the play. But then to not include such language risks the alternative of denying the wide-spread everyday racism of the past. Do I have the characters actually debating race in Dr Bucke’s work? That seems like one option. I attempt to write a sequence doing so, but it ends up as the worst of all possible options. Either it offers laboured exposition to excuse the characters for their views, or it risks totally alienating the audience from the characters by not excusing them. After several varied attempts and feedback from others, I abandon the scene. There must be another way to represent race more fully and interestingly than that. So, what if Whitman embodied this on stage, became a metaphor for our universal humanity. If Whitman, in reality an old, white man, was instead played by a young, woman of colour, doesn’t that open up the representational meanings within the play in a way that is entirely consistent with Whitman’s poetry? As soon as I talked the idea through with the script development team, we knew we were on to something. Our casting call for Whitman was specifically for a black woman and out of the amazing talent that we saw, the very best fit was Billie Meredith. In addition to giving a remarkable audition, Billie also bought the added layer of herself being a poet to the role. 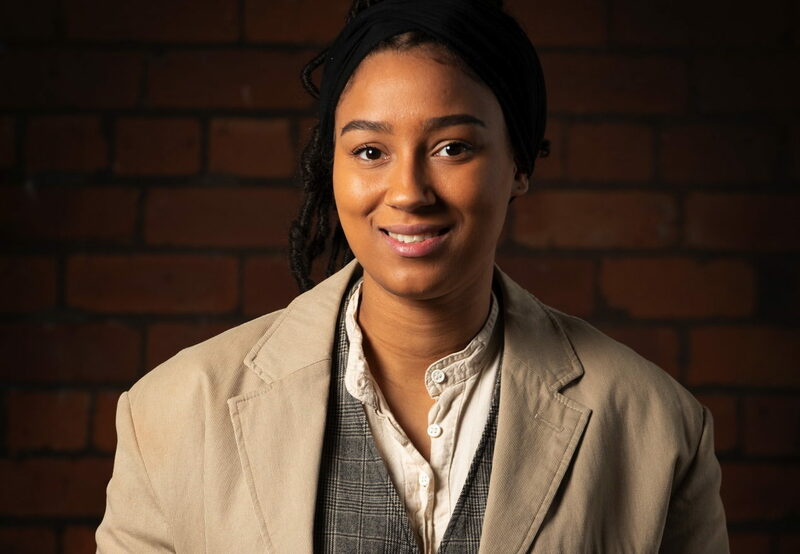 She’s part of the collective Young Identity who have written a piece, co-made with FlexN, on at the Manchester International Festival in July called “Alphabus”, a thrilling exploration of power and weakness, triumph and tragedy, antiheroes and fallen angels. I think Whitman would look at Billie, and her work, and be very pleased with his new embodiment. And I hope the show is one contribution to widening the debate about how different cultural heritages can successfully be represented in heritage performance about white pasts. The Adhesion of Love concludes its tour in Bolton with performances at 7.00pm, 21st March at Bolton Museum and 7.30pm 31st May at Bolton Socialist Club at 7.30pm. For more details visit outingthepast.org.uk.